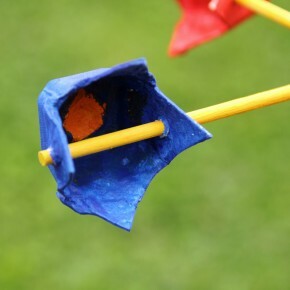 Traditionally kids fly their kites on a windy day. 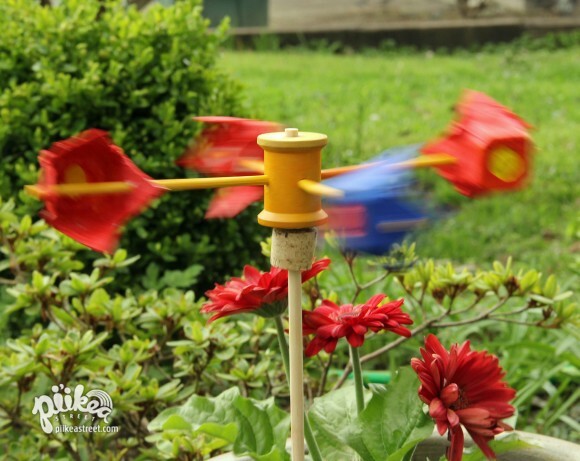 This anemometer craft will give you another option the next time some blustery weather hits your area. An anemometer is a tool used by meteorologists to measure wind speed. Because a power drill is needed, you’ll need to get a grownup to help you out. First prepare your cups by cutting 4 egg holders out. Then shape them a bit so they look like a 4-petalled flower. You can paint them if you like. Tip: If you paint one of the holders a different color from the others, then it will make counting the rotations a lot easier. While your paint is drying, ask a grownup to fire up their power drill. Hold the spool in place lengthwise using a workbench. Drill a hole through in the middle using a 3/16” drill bit. Check to see if the dowel fits. If not, drill a bit more to make the hole wider. Remove the spool, make a quarter turn and secure it back into the workbench. Drill another hole through the spool. Sand down any wood splinters. Next, switch the drill bit to ¼”. Cut the cork in half and secure into workbench. Drill a hole through the middle. Set aside. Use a coping saw to cut the 3/16” dowels into four 5” long pieces. Set the spool on a flat surface and place the ¼” dowel through the top hole. 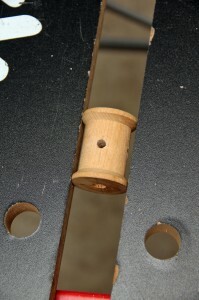 Add glue to the four drilled holes and place a 3/16” dowel into each making sure they don’t touch the middle ¼” dowel. Allow to dry. Next, punch a hole in two of the petals of each cup to feed the dowels through. You may need to use a pencil to gradually make the holes bigger. You want the holes to be snug not loose for the dowel. 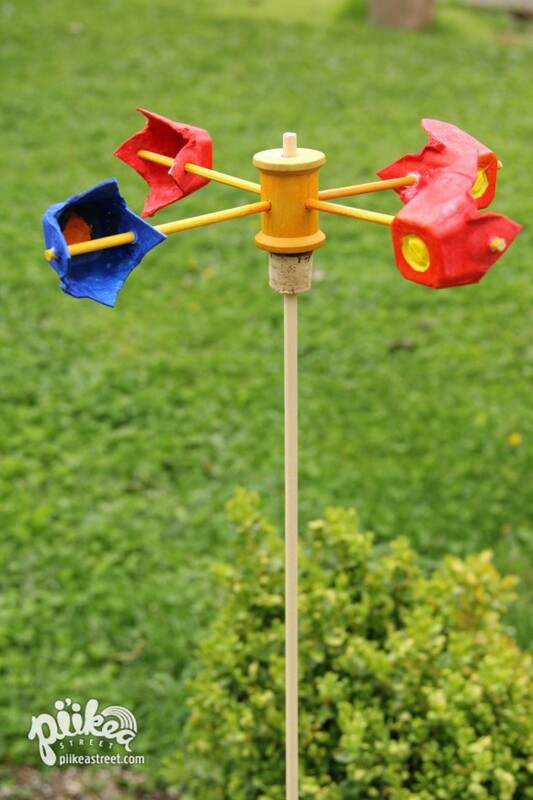 Finally, put together your anemometer by placing the cork and washer on the ¼” dowel. Then set the spool on. 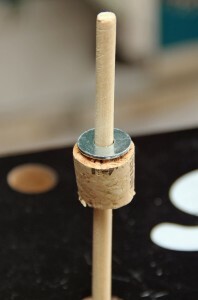 Attach a cup onto each 3/16” dowel and make sure they’re all facing the same direction. 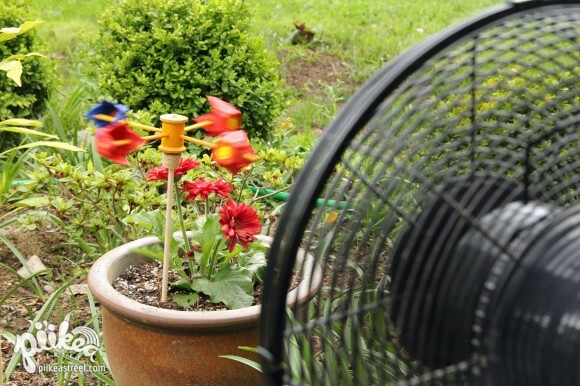 On a windy day set your anemometer in the ground or a flower pot. Make a chart and take note of how many rotations your anemometer makes in a 30 seconds. Compare the results to other days. Or just have fun watching the cups spin. Isn’t it mesmerizing? We were not experiencing much wind this day so I had to create some with a fan. If this craft was a bit advanced or you just don’t have access to a drill, then please stop by again for our next post. We’ll share instructions on how to make a basic version of the anemometer. This is great! My son would adore it and your tutorial is so clear. I’ve featured this on my blog today as one of my favourites from last week’s Weekly Kid’s Co-op. Thanks for linking up.